Ramen noodles often bring about memories of university days, staying up late studying for an exam and ready to microwave just about anything for a cheap bite to eat… Luckily those days are long gone for many of us, and as we grow older and wiser, we know deep in our hearts (and our stomachs) that we have adopted a Paleo lifestyle for better health and greater enjoyment of life – that includes everyone here today. Instead of the old ramen version, which is enriched wheat flour with preservatives, flavor enhancers and soy sauce, we would like to present our much more enticing chicken ramen with zucchini noodles, or zoodles, if you will. Now, this recipe cannot be done in just three minutes in the microwave, not a chance! So that you can plan ahead, know that it will take about 40 minutes for prep and cooking, but think of all the nutrients, cooking experience and appreciation for quality food that you have to gain. And your health is extremely important, whether you are in school or not, simply feeding yourself or a clan of youngsters (hint: they will likely eat this too! ), and there is no good reason not to make this soup for dinner tonight. It’s simple, it is health-giving, it is wonderful. Alternatively, you could make a creamy chicken and vegetable soup, if it is the old-fashioned chicken soup that is on your mind, but we know you’ll choose this recipe the next time you are searching for that new Paleo comfort food, after all, zucchini ramen noodles are that good. In a pot, melt the coconut oil and add the onion. Fry until the onion is soft and translucent, then add the garlic and chili. Fry until fragrant, then pour in the chicken broth. Add the chicken breasts and allow to poach until just cooked. Remove the chicken breasts and set aside. Add the coconut aminos, broccoli and shimeji mushrooms to the broth and allow to cook for 5 minutes; then add the zucchini noodles and cook for another 5 minutes. 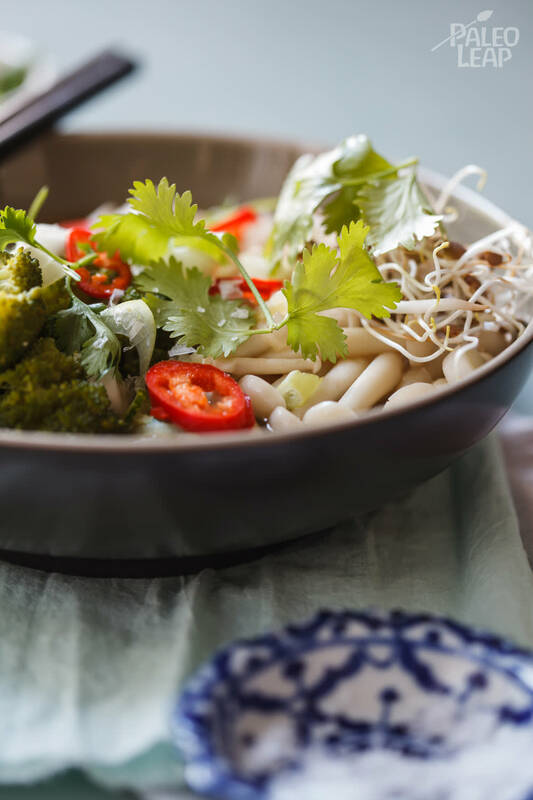 Serve the vegetables and broth topped with sliced chicken, bean sprouts, cilantro, fresh chilies and green onions.